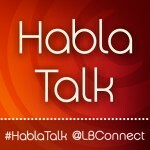 This essay is part of the first #HablaTalk writing prompt series I am doing with Latina Bloggers Connect. They’re a way to inspire the writer, bring out the video star, and promote the community of talented voices. Check out the community and join in. A few weeks ago, I escaped on an overnight to Atlanta with a good friend. She had an appointment down there, 4.5 hours south of Nashville and I basically invited myself. The plan was to eat and shop…and we did, though I did not score anything much. I do not count the $39 Ikea blanket as a fabulous score, despite the reasonable price. I marked it as “necessity.” I got one cool dress, but my goodness, there was disappoint to discover II can’t even score big with the clothes in Atlanta. Something is wrong with me and I think it is a combination of age 44 and extreme cheapness. However, success was found in solitude, in the disconnect from the daily routine — the lunch-making, the car-line, the working, the cooking, the dog walking. I know you know. When my girlfriend left for her appointment early in the morning, I was left in a hotel room all by myself for five hours. I had coffee, watched the morning shows — which I rarely ever do — I read the free newspaper in bed. I went to the gym and worked up a sweat. I took a long shower. I sat at the desk, fiddled with Twitter and Facebook, jotted down writing ideas, read about Angelina in Vanity Fair. I wore fuzzy socks. In my college world religions class, I learned about a culture who believes that when we die, our soul travels up to the top of the Universe and is suspended for all eternity in its own Bubble of Bliss. There are others in their own Bubbles of Bliss all around you, but you don’t know it, and if you did, you wouldn’t care anyway, because you’re in your own Forever Bubble. 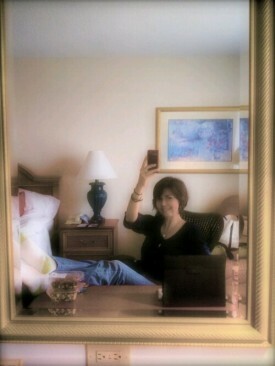 Hotel rooms are my own Bubble of Bliss. I didn’t think about this much until I started attending blogging conferences. For as much as connecting with my tribe is wonderful, heading back to a hotel room alone is just about as sweet. Writing down all this hotel love, I am struck at the memory of thinking a friend of mine odd for her hotel habit. She told me about it maybe seven years ago, or so (Our daughters are the same age). Every once in a while, when she needs to disconnect, to recharge, she leaves the husband and kids at home and checks into a local hotel. I remember her telling me that she sleeps well, she reads, she watches movies. As the Atlanta escape ended and my girlfriend and I got back in her Mama Fab Van and headed north to Nashvegas, I was recharged (an a little high on free hotel coffee). And a recharged me means I connect better with my family and the creative goods flow better in my work. And well plus, I’m always happier when someone else makes the beds.